Diwali is auspicious festival of hindus. In India Diwali is celebrated with lot of joy and happiness. Diwali is festival of lights. This year diwali celebration will start from Dhan Teras 21st October, 2014 and will end on Bhai beej 25th October, 2014. This year Diwali will be celebrated on 23rd October, 2014.On Diwali people wear new cloths, decorate their homes, made good food and burst crackers with family and friends. 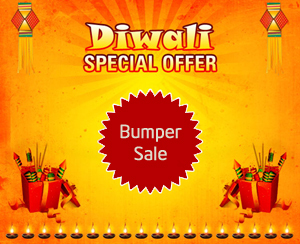 We are herewith best discount offers and bumper sale details of Diwali 2014. Samsung is running amazing offer for Diwali 2014. Samsung is offering free galaxy tab 3 Neo on purchase of Samsung Refrigerators. Apart from this you can also expect Smart Lock ‘N’ Seal Kit worth 1999 Rs/- as free gift. If you are planning to buy Samsung Washing machine or Dish washer we have good news for you. You will get Free steam iron worth 1445 Rs/- as free gift this diwali. Apart from this you can also expect 9990 Rs/- cash back. If you are planning to buy Samsung air conditioner or Home theater system you can get cash back up to 9990 Rs/-. LG this year brings unique offer of 10 year warranty. This offer is applicable on purchase of LG refrigerator and LG washing machine. If you are planning to buy LG Oven you can expect complimentary gift like casserole set, extended warranty etc. On purchase of full HD LED TV you will get free DVD player. Apart from this on other LG TV’s you can get cash back benefits. Videocon is offering heavy discount on TV. Apart from this you will get free 3G calling Tab. On refrigerator you will get 2G calling tab free. On Videocon washing machine you will get heavy discounts. Nokia Lumia is providing smart cash back offer. You can avail guaranteed cash back of Rs.1001/- on Lumia 530 and Rs.1501/- on Lumia 630. You can also get chance for 100% cash back. This Diwali LG is offering very good discount offer on LG G3 mobile phones. If you purchase LG phone by SBI debit card you can expect additional 5% discount. Lenovo this time brings e-voucher benefit from 2000 Rs/- to 10,000 Rs/- on selected laptop models. On tablet you can get e-voucher worth 799 Rs/-. Honda can make your diwali joyful. You can purchase Dream Neo and Dream Yuga motorcycles and receive 100% insurance benefit on this vehicle. This year on diwali Maruti brings you sona chandi festival.There is a guaranteed Gold Coin free for every customer who books any of the Maruti Suzuki cars. The second deal says that customers will get 30 grams silver free while exchanging their old car with the Maruti Suzuki’s new car. Mantri Realty is giving Vardenchi Motorcycle worth 6 lakh on purchase of new apartment. Maitreya Realtors is offering exciting Scratch & Win offer for customers from Dussehra to Diwali. Apart from this they are offering discount from 50,000 Rs/- to 5 lakh. Rustomjee group is offering very lucrative benefits to customer. Benefit includes 10% cash back, Free Maruti Alto, No stamp duty, No registration charges, Free Club house membership, Zero maintenance for 12 months. Hope you will enjoy diwali 2014 offers mention in this article. If you come across any other discount of diwali offer do share with your friends by adding it in comment section!